Today I woke up tired ….. like I ran some kind of a marathon tired. But of course I did not run so much as a block so what did I do yesterday that wore me out? Oh yeah – DRIVING in Mexico. We have been spending the last few days buying plants and pots for our tiny garden spot. 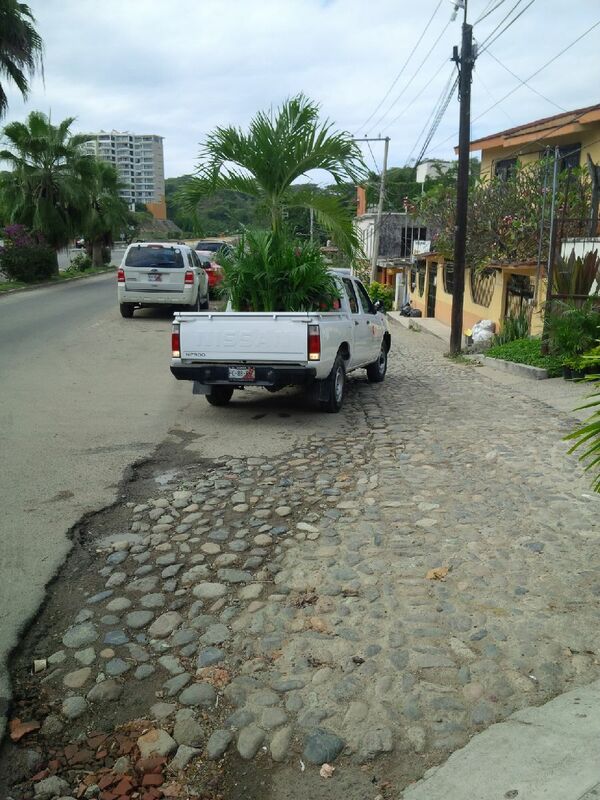 Which meant driving between a Vivero (greenhouse) in La Cruz and Home Depot in Puerto Vallarta… a bunch of times. You really have to experience driving here – my explanation won’t do it justice – but I’m going to try. First of all, this is the busiest week of the year (darn tourists) so the roads are crazy busy. But what’s exhausting is the way the roads are set up. There is a main highway that leads from PV north through Bucerias and on to La Cruz, Punta de Mita and Sayulita. The thing is that on both sides of the highway are lateral roads – we call them service roads at home. All the businesses you want to visit – and by businesses I usually mean a bunch of stuff under a tarp on the side of the road – must be accessed from the service roads. At home, you exit on the service road and turn right or left to find your destination. Here, you sharply veer off the highway, sometimes dropping many feet while merging with crazy cars coming from behind. The laterals are one way – which means you must exit before the business you want to visit. 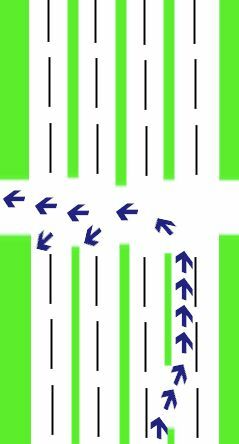 If you are on the highway and miss the correct exit (100% of the time) you must drive a few more miles to the next retorno (turn around spot) and drive back and start the whole thing over. Now when you get to the retorno, it’s not as simple as turning left at the corner and circling back. Again, you must veer off the highway onto the right lateral road, wait for the green arrow and turn left from the right hand lane. And of course, not only are you watching for the buses and taxis that are edging in front of you at the light, but you are digging in your pocket for coins to give to the guy washing your windows and the juggler entertaining you. The business we want to visit is almost positively right before the exit – missed it again…..
As happened yesterday, some guy stops in the driving lane in front of the piñata store, and with a whole line of cars behind him, goes in to choose his piñata. He eventually carries out the largest piñata I have ever seen, puts it in his car and while all of the cars behind him begin honking in protest, he goes in to pay for the piñata. So we missed two lights for a piñata purchase. And it’s not just exhausting – I literally have 2 or 3 bruises on my arms and knees from hitting the dash and the door of the car while we bump over the roads and the mountainous topes (speed bumps). I guess the real problem is that we’re cheap. We went to every Vivero in the district because the prices were just too different. We really needed to compare. We bought a 12-foot palm tree for $250 pesos (about $20) but another garden quoted us $2500 pesos. So I’m not exactly complaining – just realizing that we need to pace ourselves a bit and plan our routes each time we leave the house. And maybe wear kneepads and elbow pads. For $10, the garden guy offered to deliver our plants to the house, and they arrived within an hour. After all that driving nonsense, our car was filthy. By the time we came out of Home Depot our car was sparkling clean…. We tipped the guy a couple of bucks. So as we bring this year to an end, we are both so grateful for this adventure and for the house we are slowly turning into a home. It is definitely not the home or the neighborhood we expected, but we are loving it and embracing it. I can’t believe I have a spot to sit in to read and pray and meditate that is filled with beautiful tropical flowers – not a petunia or geranium in sight. I own my own palm tree – 2 in fact. How cool is that! When we have everything in place, I’ll show you all the final product. And now I wait for New Year’s Eve festivities to begin. Considering how many guys were selling fireworks on the road today I have a feeling it will be a long, loud and crazy night in the neighborhood. This entry was posted in Mexican culture, Uncategorized and tagged bucerias, Driving in Mexico, living in mexico, Moving to Mexico. Bookmark the permalink.